A new book of spiritual reflections by Joy Cowley, one of New Zealand’s favourite and most influential spiritual writers, is to be launched at St Joseph’s Church, Mt Victoria, at the end of October. 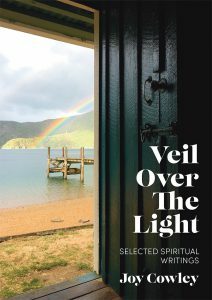 Veil Over The Light – Selected Spiritual Writings by Joy Cowley will be launched on October 27 at 4pm. WelCom readers are warmly invited to attend. At Joy’s request, the reflections in the book are complemented by a series of photographs, taken by Mike Fitzsimons. The book’s spiritual wisdom will speak to people of all ages and circumstances, says Mike Fitzsimons. ‘These writings are the fruit of a lifetime’s spiritual endeavour, a guide to the spiritual life written by a poet and fulltime practitioner. ‘Joy’s great gift is to able to describe in a very compelling way what it is like to experience God for real. Reading her reflections is a journey away from the peripheries of religious practice to the heart of the Christian life, the living water.